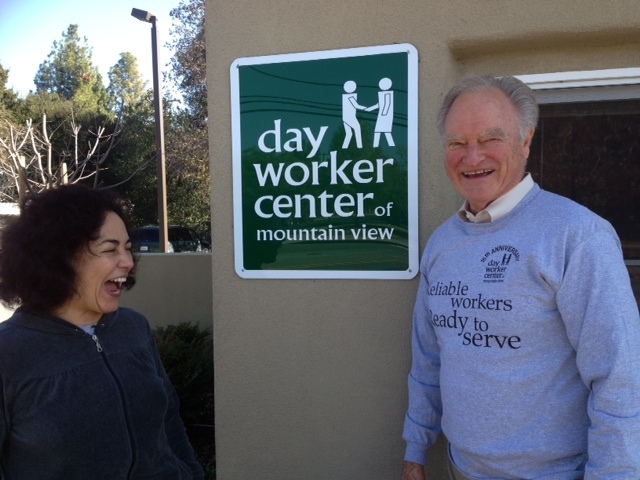 This past Friday I visited my friends at the Day Worker Center in Mountain View. My host, Executive Director María Marroquín, gave me a tour of their new home, introduced me to the people they support, and fed me a lunch of chicken, rice, and tortillas. Serving northern Santa Clara County, the Day Worker Center acts as a hub where day laborers are able to congregate while they await short-term employment opportunities. Approximately 60 people arrive at the Center, and it is a good day when 5 people receive work. While the laborers wait patiently to put their array of skills to work, they learn English and cook lunch for everyone. I helped out with lunch by traveling around to the local coffee shops to collect pastries. We also picked up old coffee grounds for them to use in their organic garden. Back at the Center, someone was teaching women how to make jewelry, while others were practicing musical instruments before they hit the streets to perform. My visit there was like looking poverty in the eye. Yet these dedicated individuals show up day in and day out ready to work tirelessly on any projects thrown their way. By offering their services through the Center, these laborers are able to connect to employers in a safe and respectful way, which is empowering for them. I was deputized during my visit to the Day Worker Center. PVF has funded the Day Worker Center since 2004 because of their veracity. Recently, we helped fund a solar power grid that sits atop their roof and are now pitching in for a commercial stove. We support them, just as they support each other; for example, one laborer is currently sick and therefore unable to work, so everyone is contributing to his rent. I imagine it is this sense of community and support that generates all of the smiles I saw that day; the Day Worker Center is saturated with a friendly and benevolent air that is infectious. This entry was posted in Uncategorized and tagged poverty, Santa Clara County, Where's Bill. Bookmark the permalink.